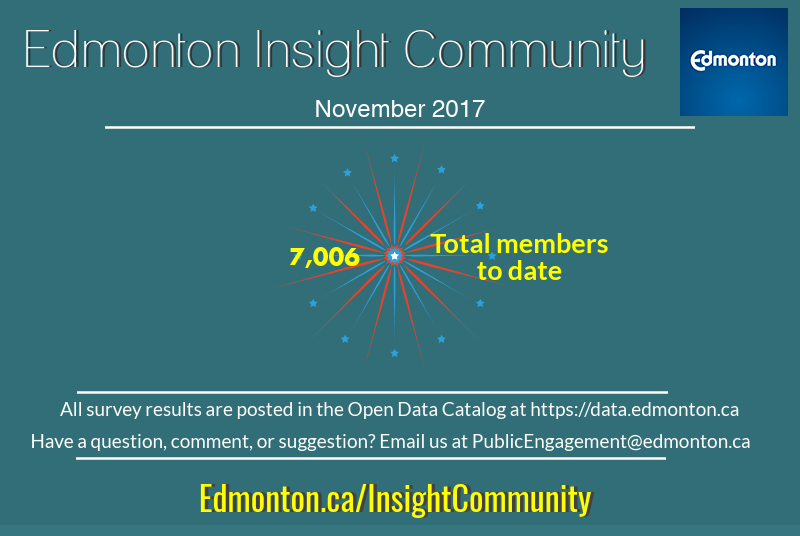 Thank you very much for being a member of the Edmonton Insight Community and for your interest in City of Edmonton issues. The Insight Community took a break during July, August, September and October out of respect for the municipal election campaign. which ended with the election on October 16, 2017. ​Each month we do our best to post results of the Mixed Topic Surveys and share them on the City of Edmonton's Open Data Portal (https://data.edmonton.ca/). No open comments are available as they may be personally identifiable. The City of Edmonton is excited to provide fun and coordinated engagement events for everyone. Share your voice on many important topics in one convenient location, at one time. Free food and warm beverages, Les Boucherons Maple Sugar Shack, children's programming and more will be onsite for the event. Next event to take place Thursday, December 7, 2017 from 4-8pm at the Edmonton Tower Main Lobby (10111 104 Avenue). For more information check out the event details.